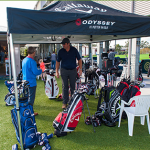 Now that winter is on its’ way your practice hours have been shortened but that doesn’t mean you can’t continue to hone your skills. 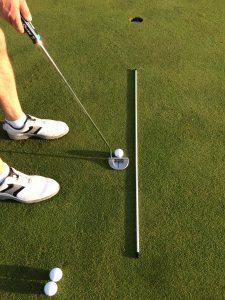 This easy putting drill is handy to do when the winter sun is setting, using the flagstick as your guide. See picture one (below) and look at the shadow that is cast. It is the perfect straight line to the hole. Place your ball alongside the shadow line, now practice squaring your putter to the ball and stroking it to the hole. Observe how the ball travels, did it stay straight? Or did it move to the right or left? If your ball did not run along the line, then most likely, your swing path is incorrect. Practice taking your putter back on the shadow line and striking the ball. 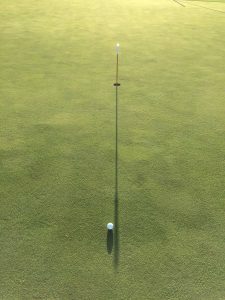 Striking the ball with a square putter at impact and keeping the club face square along the shadow line, will result in the ball rolling correctly to the hole. 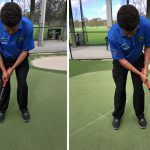 Another good drill to reduce your putting stats is to use an alignment stick as shown in picture 2 (right). Running your putter along this alignment stick will ensure that you stroke the ball correctly. 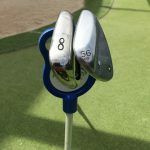 It is a very easy way to determine the error in your putting stroke. 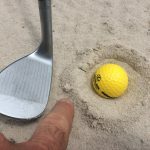 If you are hitting the stick on the way back, you are obviously pushing your putter out, this then means your putter, when it hits the ball, will be closed at impact, resulting in the ball missing left of the hole. Conversely if your putter goes too far inside the alignment stick you are likely to push the putt resulting in a miss to the right. 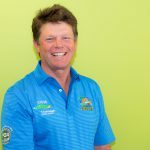 While a short metre putt may mean a slight miss either side of the hole, when you add distance to the length of your putt, the miss will be increased, hence introducing the dreaded three putt. So stay out of three putt territory with these two putting drills and get those stats down.